Floral shirts like Magnum P.I., chiselled surfers walking along the beach with their board under their arm, young ladies welcoming the visitors with flower garlands, colorful cocktails in the shadow of a palm tree, unforgettable sunsets reflecting in crystal waters, all this accompanied by the sweet sound of the ukulele…This is Hawaii! It takes quite a bit to get there (flight from Los Angeles is six hours long), but once you get there, you instantly forget all the troubles, enchanted by the magical atmosphere of these dreamy islands. 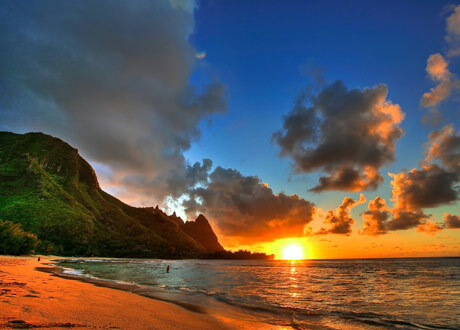 Hawaii is an ideal destination almost all year. During summer months, from May to October it is very hot, but even in winter, from November to April, temperatures are still warm and pleasant, with some possible sudden storms. Hawaii islands are like precious gems scattered in the middle of the Pacific Ocean, some 3200 km away from the American coast. They are, in fact, emerging peaks of underwater volcanoes and only six of them are open for tourism. Every island has its own characteristics, just like a precious stone has many facets…it is up to you to choose which ones will be enchanted by! 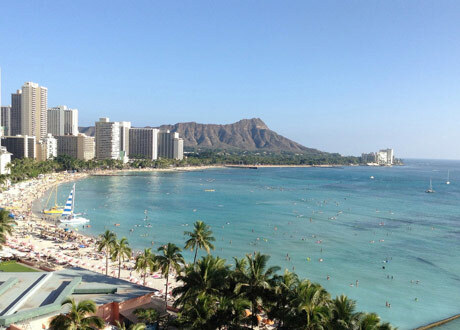 Oahu (Honolulu/Waikiki) is perfect for surfing on the northern beaches and for enjoying its vibrant night life. Maui is the island that has the most beautiful beaches and plenty of opportunities for sport activities, Kauai offers magnificent scenery and most adventurous trips, Big Island will give you the chance to experience the breath-taking view of a constantly erupting volcano, Lanai e Molokai are the smallest and wildest islands, ideal for those who just want to get away and be able to relax completely. The glamorous Honolulu, tropical forests, Pearl Harbour, volcanos and, of course, surf! Honolulu and Waikiki, and much more. Honolulu is the financial center of the Pacific and the cultural cornerstone of the entire Hawaii; on the other hand, the beaches of Waikiki are world-famous as a symbol of Hawaii, with girls doing the hula dance, frantic night life and Hawaiian music. espite the tourism and frantic activity, Oahu still has harsh and uninhabited lands, and there is not a single road that makes a full circle around the island. 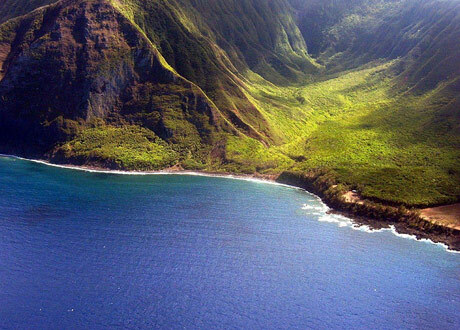 Remember the deserted island scenery from the TV show Lost? Well, it was shot right here in Oahu! It may seem incredible but just a half-hour drive from chaotic Honolulu you can get lost in dense tropical forests, go snorkelling in the crater of an ancient volcano in Hanauma Bay, go on trips along the spectacular mountain ranges or jump in the crystal-clear waters of bays protected by coral feeds. Oahu has two volcanoes in the middle of a plateau and the Pearl Harbor lagoon. The eastern coast is known mostly for the spectacular Ko’Oalu Range, a group of emerald mountains con vertical walls; the northern side, on the other hand, is the surfers paradise – especially in the winter, when the ocean forms colossal waves! The Western coast is the least touristy one, but it is still worth a visit, because here you can actually see how the locals live. In addition to these areas, all of which can be visited in one day with trips from Honolulu/Waikiki, you should also visit Perl Harbor, the Pacific headquarters of the american fleet, with its touching museum dedicated to those fallen in the Japanese attack during the World War II. 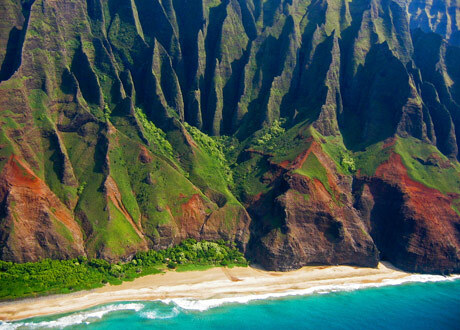 Probably the best hawaiian island if you're looking for pure nature, sea and activities! 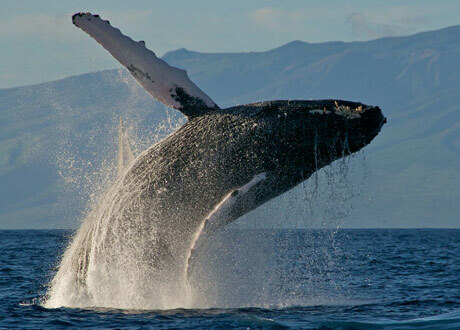 If you do not know which island to choose and you are a lover of wildlife and pristine nature, Kauai is the one! The oldest of the Hawaiian islands offers the spectacular scenery created thanks to over six millions of years of erosive processes. Many major movies, from Jurassic Park, Avatar and King Kong were filmed among the majestic cliffs of Na Pali and the enormous Waimea Canyon. A marvellous island, away from the beaten tourist paths…Red earth, white and golden beaches, rich vegetation, no big cities and some 60.000 inhabitants make Kauai a little bucolic corner, perfect for a romantic getaway or a family vacation. If you are looking for nightlife and entertainment, this is not the place for you, and instead it offers many possibilities for trekking, snorkelling and surfing. The real gem is, however, the helicopter tour over the canyons, rainforests magnificent waterfalls and uninhabited valleys. To get here, you land with an airplane in Lihu’e, a small town that you will leave behind right away, since it doesn’t offer any particular attractions. Most tourists head straight to the beaches of Wailua and Kapa’a, some twenty kilometers from the town, but if you continue further to thenorth you eill find yourself in the most fascinating part of the island. 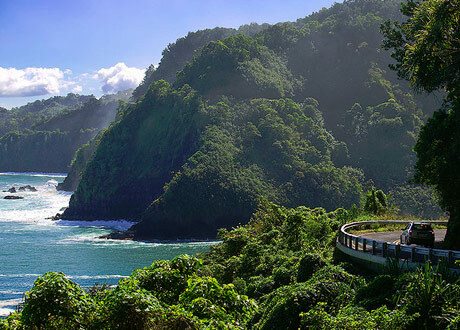 The coastal road to Na Pali is amazing, with thick rainforests on one side and gorgeous golden beaches on the other. After a while, those are replaced by majestic cliffs which keep getting higher and higher until it becomes impossible to continue by car: once you enter Haena State Park, you can only proceed on foot along the old Kalalau path. If you are in good shape and with the right equipment, you can reach some of the natural wonders such as the Hanakapiai falls and Hanakoa valleys. This part of the island is one of the last remaining pieces of vast, uninhabited and savage land in Hawaii, and definitely merits a visit. If you don’t feel ready for a demanding trip, there are various boat tours that will allow you to admire it from the sea. Miles of sandy beaches for surf, windsurf and kitesurf plus volcanoes, tropical rainforests and mountains! 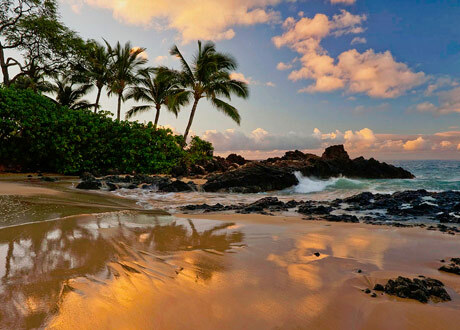 Maui is all this, a mix of gorgeous beaches, tropical landscapes, rainforests, volcanoes and high mountains. Tourists are generally younger and more dynamic compared to Honolulu/Waikiki, the night life is vibrant but there is also plenty of opportunities for sport and trips throughout the day. Windsurf, diving, whalewatching, sailing, snorkelling, biking, trekking on the crater and horseback riding are just some of the things you can do during the day…in addition, obviously, to surfing on the waves and cruising the island on a motorcycle or an ATV. The Western part of the island is the most famous one, and it offers some incredible contrasts: on one side there is Lahaina and Kaanapali, which are the most famous and visited tourist locations, and on the other, you just have to move some twenty miles further along to reach the West Maui Mountains, a region so harsh many of its parts are still unexplored. 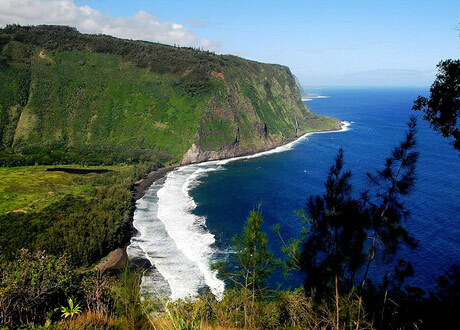 In the central region of the island, in addition to Kahului, which is the urban center and the location of the only airport on the island, there is the glorious Lao Valley State Park, a natural park that goes deep into the rich rainforests of the volcanic Maui inland. The Western region is the most touristy one, but don’t get discouraged by the enormous resorts: just pass them and you will reach one of the most beautiful coastlines of the whole of Hawaii; furthermore you shouldn’t miss Haleakala, the largest inactive volcano in the world. 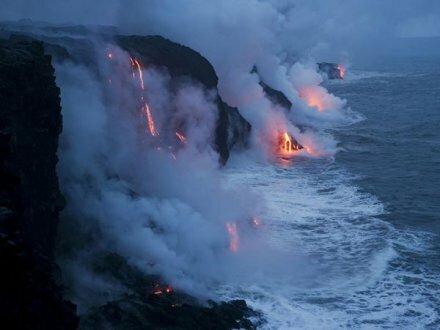 Big Island, just as its name suggests, is the largest of the Hawaiian islands and the only one with active volcanoes. The landscape is quite diverse: temperate coasts, snowy mountains, rainforests, deserts, long flowery expanses and large cattle farms…but also white sandy beaches, warm turquoise waters and coconut trees. 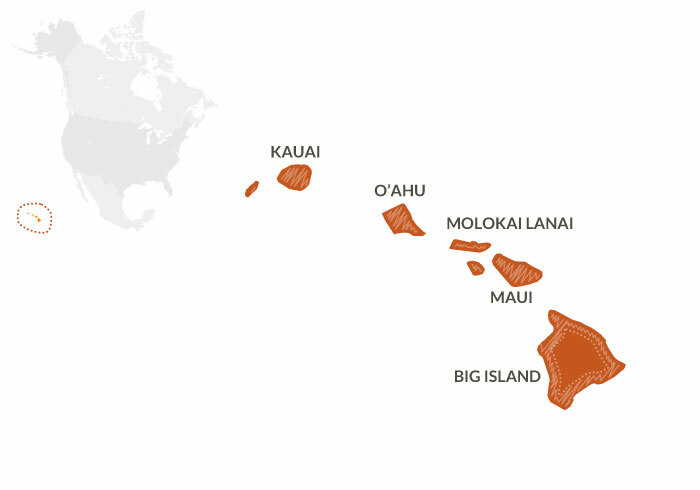 Hawaii Island, also known as the Big Island, is so big that all the other Hawaiian islands together make up just a half of its area. It is famous for its beauty and for the astonishing eruptions of lava which have been going on continuously since 1983, changing the outline of the island. Kilauea, the main volcano on the Big Island, is so active that every year its eruptions make the area of the island even bigger! It is highly recommended to spend a few days on the island, not just to witness the incredible eruptions that will make you think you’re en route to the center of the earth, but also for the complex beauty of this island: coasts, ocean, forests and magnificent national parks with numerous opportunities for trips and visits. Big Island doesn’t have any tourist or exclusive centers like Waikiki or Kaanapali, the vibe is much more laid-back and peaceful – ideal for spending a few days in paradise among the beaches, total absence of any form of pollution, and some of the most exciting trips in the world. Don’t miss the Hawaii Volcanoes National Park, created around the peaks of Mauna Loa and Kilauea. The park is so extraordinary, it was included in the Unesco World Heritage. Within the park there are plenty of places to explore (night trips are particularly interesting), but don’t forget to read the bulletins: Kulauea is the most active volcano in the world! One last word of advice: do not leave the island without trying the strong and fragrant Kona coffee or checking out a Hula show (they have those in all the islands, but here they are the best). Small islands, laid-back vibes, off-road adventures and timeless atmosphere! Welcome to Molokai! Time goes by slowly on this island of only 61x16km, populated almost exclusively by the natives and where the spirit of Aloha is the governing principle. This island may not offer the gorgeous beaches and nature you find on Big Island, Oahu and Maui, but has one major appeal: many people come here for the laid-back vibe of this small island, almost as if to see what Hawaii mush have been like fifty or sixty years ago (it sounds incredible, but you won’t find a single traffic light or an elevator in the entire island!). The island is dominated by two volcanoes separated by a saddle-shaped valley that runs between them, and the most spectacular shore is the northern one, with the world’s highest cliffs (up to 1250m towering above the ocean) and magnificent valleys, which are, unfortunately, inaccessible. There are not that many hotels but they are all exquisite and, just like in any other part of Hawaii, it doesn’t matter which time of the year you decide to visit: here, it’s sunny all year around! You can reach the island via direct flights from Oahu, Maui e Lanai, or by ferry from Maui (1h 30min). Lanai is also quite relaxed and has some amazing wild dirt roads you can explore in an ATV or on a bike, as well as golf courses and gorgeous inlets for diving enthusiasts. The clientele is made up mostly of rich locals and members of the international jet set looking for absolute privacy. If staying a few days on this island is a bit outside of your price range, you can still visit Lanai on a day trip with a ferry from Maui. We recommend you make a trip in an ATV all the way up to the 1000m-high mountaintops that make up the central spine of this island: from there, you can see all the other Hawaiian islands. Furthermore, snorkelling on the island’s most famous beach, Hulopoe, is absolutely stupendous, complete with the dolphins that often come to join the swimmers!